As far as shopping experiences go, finding a great pair of jeans on the high street used to be tough. But over the past few years, there's been an influx of affordable styles, lengths and shapes that suit every body shape. It's no longer good enough that "cheap" jeans should feel cheap, so gone are the days of ill-fitting saggy pairs made of fabric that quickly wears away. Seeing as I only have one body (and different figures suit different jeans), I decided to ask my female friends on Facebook and a few fashion insiders about the high-street jeans they consider to be the best. Almost unanimously, there was one £40 pair that many cited as being their favourite (we reckon you can probably guess their pick). However, there are a few other options I've included, as everyone's tastes can be different. Keep scrolling for your guide to the most popular pair of jeans on the high street. Out of the 30 women I spoke to via Facebook, WhatsApp and email, these jeans were consistently voted as being the best, and it's easy to see why. They're high-waisted (aka super flattering), stretchy (meaning they fit a variety of shapes) and come in many different colours. Topshop's Jamie jeans have long been a favourite among fashion girls, and the retailer's design team continues to improve them each season. Now go through the slideshow to see the other high-street jeans that passed the test. Who What Wear social media editor Alyss Bowen told me these became her favourite jeans after she spotted Lizzy Hadfield of Shot From the Street wearing them. "I have them in light blue and darker blue, as they're quite possibly the best jeans I've ever owned. They're stiff but still comfy, hold their shape and make your bum look great while still maintaining the ultimate straight leg." White jeans are great for summer, as long as you stay away from the Sangria that is. We don't need to keep telling you how much we love Weekday. Why not pair these with one of the brand's signature knits? Who What Wear deputy editor Emma Spedding loves these Weekday jeans. "These are good straight-leg jeans and go with everything," she says. "Even though I ordered them online, they were a great fit. Bonus points for the fact that all of Weekday's jeans are sustainable," says Spedding. New Look refreshed its denim last year, and it's proving quite a hit. The Life & Shape collection has stretch technology that'll flatter your figure. Dress down with trainers or dress up with printed court heels, however you wear them we guarantee you'll want them in all of the other four colours, too. This pair of high-waisted frayed-hem jeans is one of the best we've seen on the high street. We love how these look when worn with an interesting pair of trainers. Want to dress them up? No problem. A pair of heeled mules will work just as well. Who What Wear UK's Editorial Director, Hannah Almassi, recently bought some wide-leg jeans from Warehouse and has been receiving compliments on them ever since. Freelance fashion editor, Sophie Hooper, says she loves Levi's jeans. "The thickness is key, as the worst kind of denim is anything thin and stretchy. All of Levi's jeans are perfectly structured and hold their stiffness forever. I've bought vintage pairs in the past that are still in incredible condition, and every pair seems to just get better with age," says Hooper. Our readers agreed with this statement and also noted Levi's iconic wedgie fit as another great option. Update your classic mom jeans in a easy-to-wear print and it'll instantly transform your new season wares. Team with a ruffle white blouse and trainers for an easy to wear edge. All the detail of a designer pair, with all the pound saving ability of the high street – they're a win win. Embrace the kick-flare jean as part of a '70s influence to your new season wardrobe, and we promise, you won't look back. River Island is mostly known for its party wear, but what people don't know is its denim is super soft, well-cut and typically available up to a size 18. Quite a few readers told us on Facebook and Instagram that M&S is their go-to shop for denim. Why? The retailer creates super-comfy denim that gives a great shape at a super low price. The pink are one of the top sellers for spring, we know why seen as they'll go with everything from brights to neutrals and everything in between. Personally, I'm a massive fan of Zara's denim selection, and our Who What Wear readers also agree. I have a pair of straight-leg jeans that I pretty much wear every day. Not only are they comfy, but they also look great with every pair of shoes I own. Who What Wear Contributor Harriet Davey is a big fan of Topshop's latest style "I first spotted the new style on Monikh's Instagram and like most of her picks, I was sold. The fit I would say is in-between the boyfriend and the straight leg so it's perfect if you like both styles." The also come in 7 other colours, FYI. 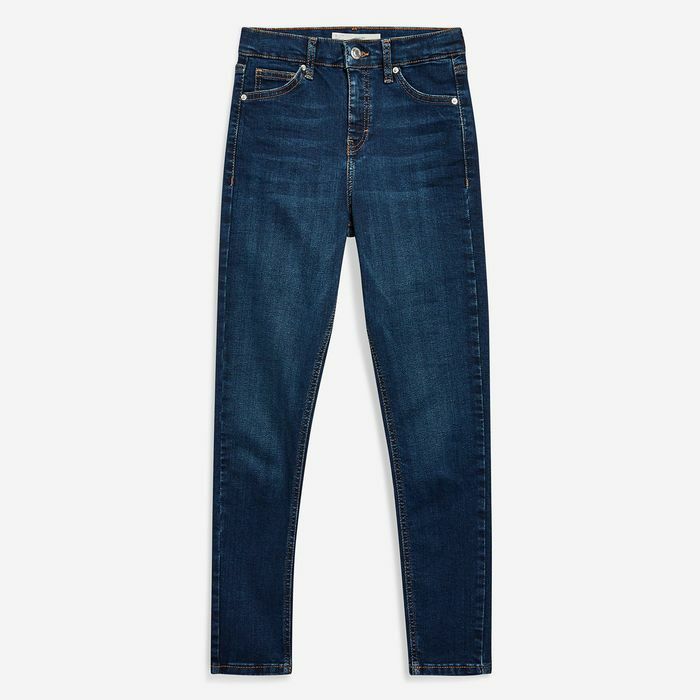 Arket are fast becoming a go-to for denim. There's something about the simple designs and effortless fit that has cool-girls like Lindsay Holland always wearing them. Sage is key for spring/summer, so naturally it's a key jeans choice. If you want a pair of straight leg jeans that'll last, John Lewis and Partners are key. They stay black for longer than most, have a slight stretch and are the ideal length to wear with flats and heels. Sold.